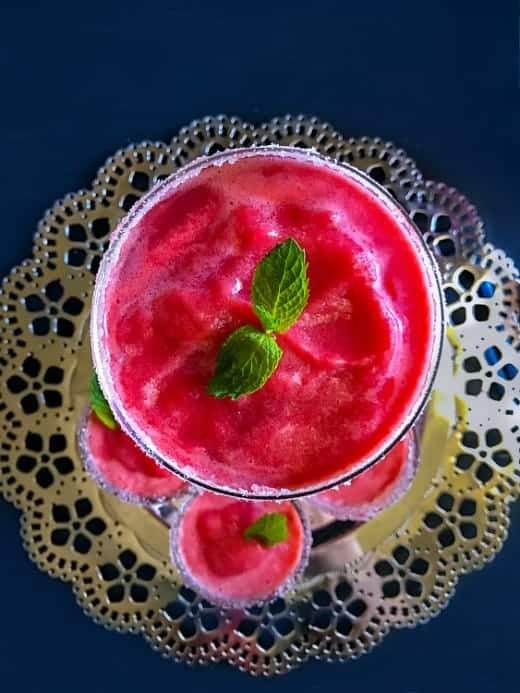 Watermelon Vodka Slushie (2 Ingredients) Filled with refreshing watermelon flavor with a splash of vodka. 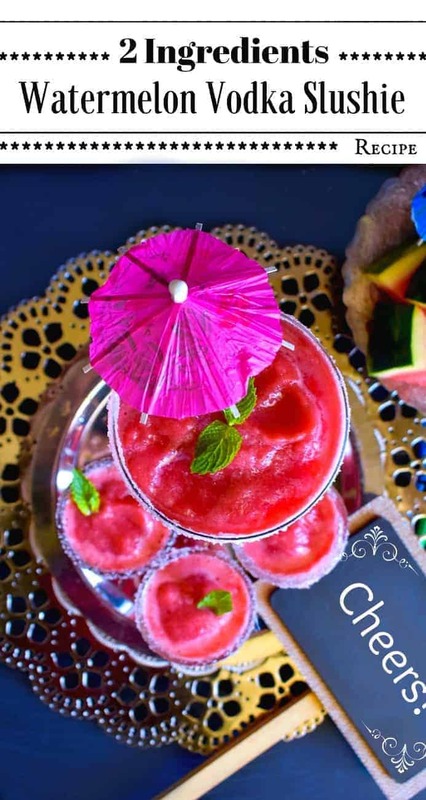 A quick, easy and delicious drink that’s perfect parties big/small or just a drink at home. 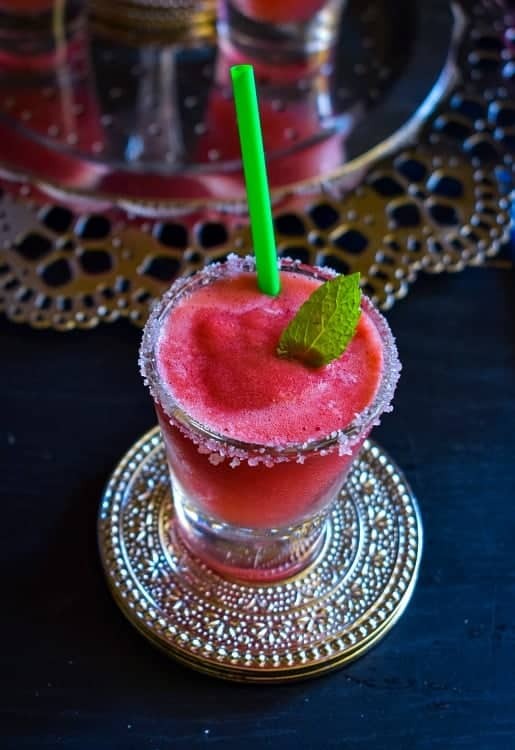 We just cannot get over this Watermelon Vodka Slushie (2 Ingredients) drinks!!! 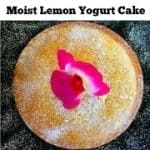 I has been our favorite summer after summer and make for a perfect long weekend drink for just you or your party. Finally, the long weekend is here and we are all set with our BBQ grill, food, and drinks. For any of you wondering, it’s a ‘Memorial Day Weekend’ here in the United States. And that means Monday is a holiday and a lot of people would even take Friday off for long distance travel. 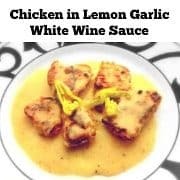 It’s also the official go-ahead for the grilling season, so you can imagine lots of grilling and BBQ happening around. If you remember, last week, I had mentioned that the guys have already planned for a golf weekend and whoever is not going, will be staying back at our place. 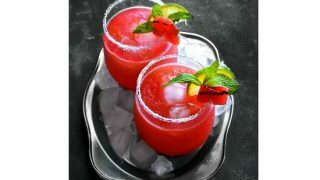 Hence, I’m arranging a variety of food and drinks especially these ‘Watermelon Vodka Slushie ! 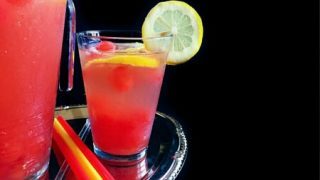 If you’re a fan of boozy drinks, then this is your best bet for a party as it’s only 2 ingredients and you can make tons of it in minutes (literally). 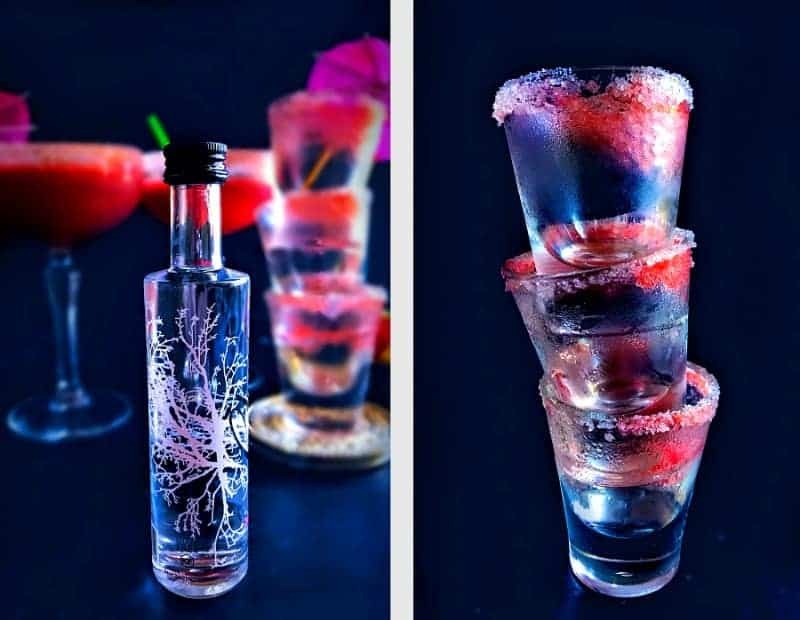 All you need is some frozen watermelon and vodka – that’s it. 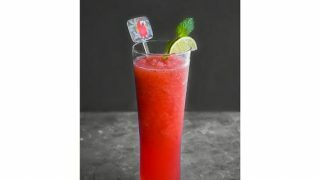 Mix everything as per your desired ratio (more watermelon or more vodka) and your drink is ready. 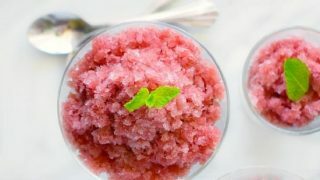 You can even make these slushies and freeze in large batches and when your party day arrives, just keep outside to thaw. 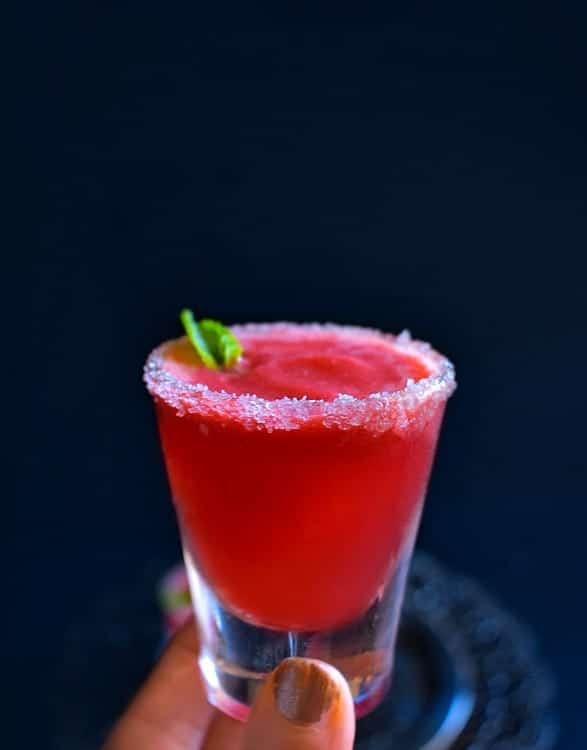 Now, I’ve added some garnish here like fresh mint leaves and sweet-salty drink mix to the rim but go ahead and add it straight to your serving glasses and serve as is. Whether I want to Eat the Slushie or Drink it ??? So I usually serve them along with spoons and straw for people to make their own decision. 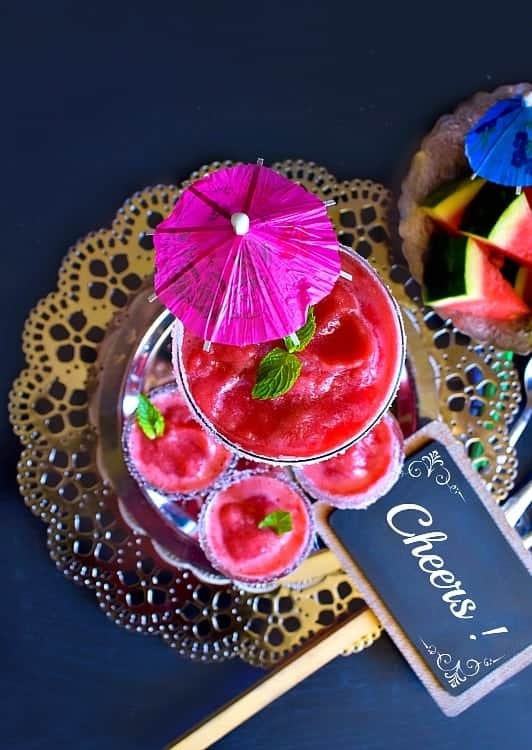 So, Cheers to the Long Weekend and you have to try this Watermelon Vodka Slushie ! Cut the watermelon into bite size pieces and freeze for an hour or over night. 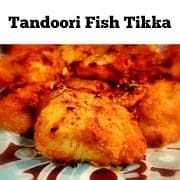 Remove from Freezer and thaw for 10 minutes. 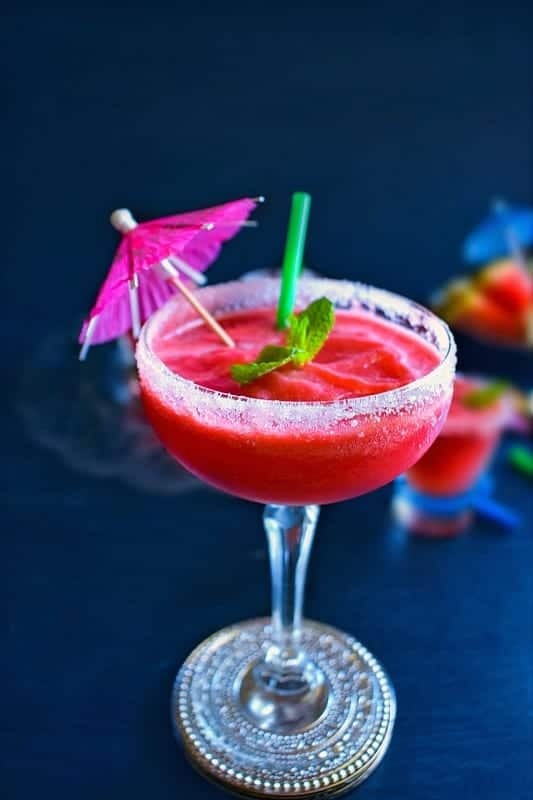 Add watermelon chunks and vodka in a food processor and blend to form a smoothie like consistency. 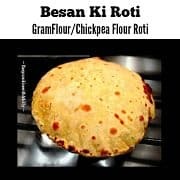 (If you like to make it slightly thinner, just add 1/4 cup of water or juice). 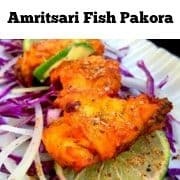 Decorate as per choice and serve immediately. 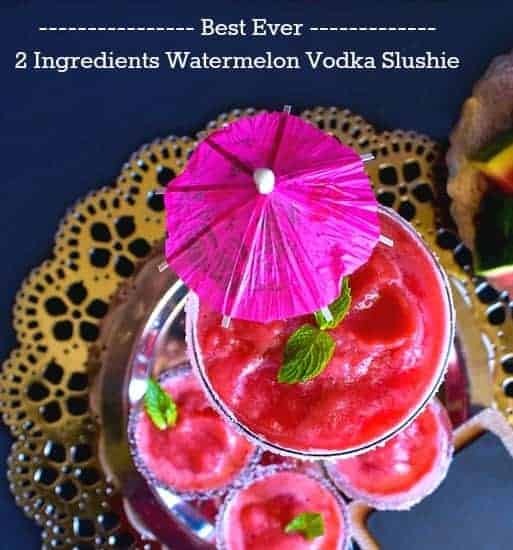 35 Replies to "Watermelon Vodka Slushie (2 Ingredients)"